We know you have lots of questions, so read on to learn about joining us this May. Shadowcliff relies on volunteers for the entire month of May! This year Volunteer Weekend is Friday, May 24th to Monday, May 27th. 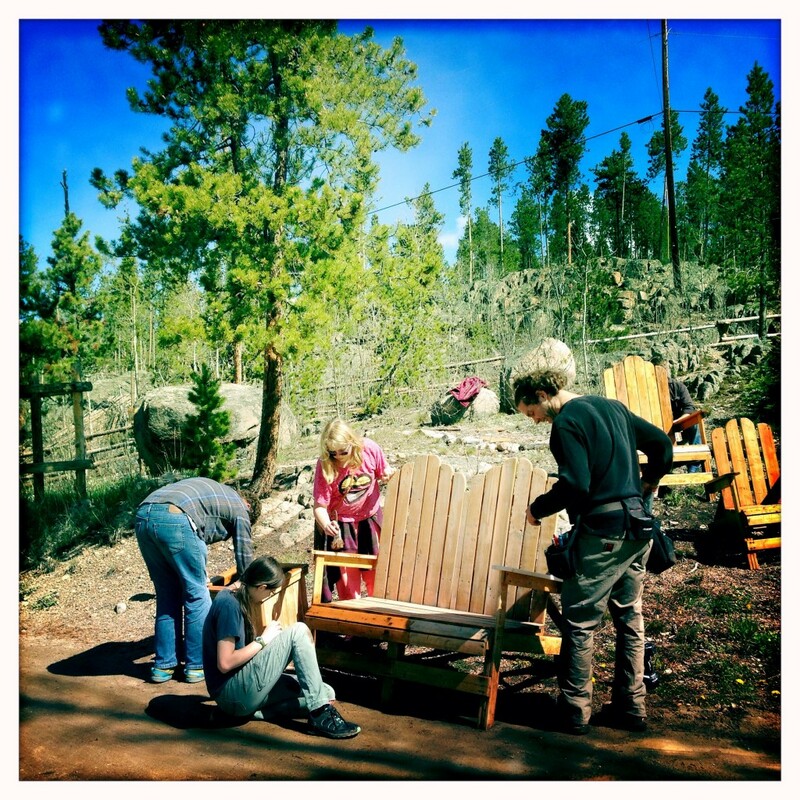 This weekend is the big push, where people with a wide variety of skills and talents come together to ready Shadowcliff for her opening on June 1st. Earlier in May is reserved for folks with construction skills and knowledge. Volunteering during this time requires pre-approval. If this interests you, please fill out the form and we will be in touch if we don't already know you. What are the requirements for attending? There aren't many, but we do have a few requirements. First, everyone attending must be willng to spend at least two nights with us. This allows for at least one full day of volunteering. Second, you must pre-register. Space can be short, especially over Volunteer Weekend, plus we need to know how many people we should prepare meals for and when to expect you. And third, you must follow our non-smoking, no pet, and no open flame policies. You can read more about those here. Anyone who is willing to work hard and help where needed is welcome. Shadowcliff has a lot of stairs and a lot of uneven ground, so anyone with mobility concerns should take that into consideration. Children are welcome and are often some of our greatest helpers. Do be aware that all children are the responsibility of their parents or gaurdians. Shadowcliff staff are not licensed to provide childcare and will be up to their ears in projects, too. Pets are not allowed at Shadowcliff, with the exception of certified assistance animals. In exchange for your hard work, we'll provide food, lodging, and the company of some of the most amazing people you'll ever meet. There is no fee for the weekend, although we do hope you'll consider making a tax-deductible contribution in the future. How many hours should I plan to work? Is there downtime? Volunteers should plan on working at least 5 hours a day. Some projects will require longer participation. You are welcome to take some down time during the weekend and explore Grand Lake, Rocky Mountain National Park, and other nearby areas. We ask that you take your downtime after the hardwork has been completed. Do you have volunteer opportunities outside of May? Yes we do! Once we open for the season we have a wonderful seasonal, paid staff but sometimes we still run short on hands, especially when a large group is on-site. Please email our General Manager, Carl Sniffen, to learn more about those opportunities. Volunteer Weekend is Friday May 24th-Monday May 27th this year. If the past few years are any indication, this year's Volunteer Weekend will be a very lively and full event. We can't wait! If you're hoping to come the week before, that's great. We can always use the help. And if you're looking to lend us your construction and cooking skills and knowledge in early May, please fill out this form and we'll contact you. Pre-approval is required for early May volunteering. New for this year: we've got in-season volunteer opportunities! If this interests you, please email Carl (our General Manager) directly. A two night minimum stay is required. You know how long it takes to get to us, and anyone staying just one night won't be able to get much work done. Singles will be placed in a room with other volunteers. If this concerns you, please let us know. Shadowcliff strictly prohibits smoking anywhere on our property. We adore pets, but they are not allowed anywhere on our property. Candles, incense, and any other open flames are strictly prohibited. Campfires are OK in designated areas when cleared by Shadowcliff staff. Children are the responsibility of their parents or gaurdians while at Shadowcliff. All volunteers must check out no later than Monday, May 27th. You are welcome to stay past that point at our regular seasonal rates, and we hope you do! Please make reservations according to our reservations schedule on our website here. Are there other people coming with you? Yes, but they are submitting their own information. Yes, and I need to enter them here. Nope, just me! OK, great. If you want to room together, be sure you you both enter each others names down below. Enter names of desired roommates. Sharing a room is standard practice for individuals attending by themselves. Families and couples will not be placed in shared rooms unless a specific request is made. Please select your gender for roommate matching purposes. Check if under the age of 18. Keeping in mind the ages, skill sets, and special talents of yourself and those coming with you, what kinds of things would you like to do? Any dietary needs we should know about?